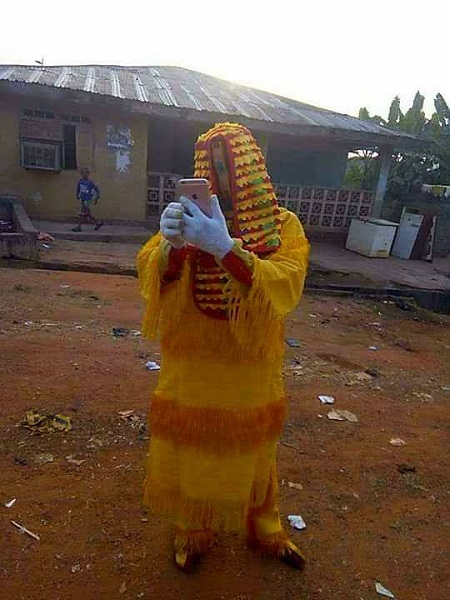 In what wold come across as a quite unusual occurrence, a masquerade has been caught with an iPhone in Imo. This is the moment a masquerade was caught using an iPhone to take selfies, an action which has caused a stir on social media. Apparently using an iPhone or any other technological device in this age and time is a perfectly normal thing to do, but for masquerades, it is quite another issue. In African culture, masquerades are believed to be messengers of the gods who are not in any way affiliated with modern day technology and so should not be using one. So it is an issue for a masquerade to want to take selfies with an iPhone. This masquerade was spotted in an Imo state commuinity. The story was shared by a Facebook user, Opaluwa Ugbede-Ojo Omera, who posted the photo on his page.